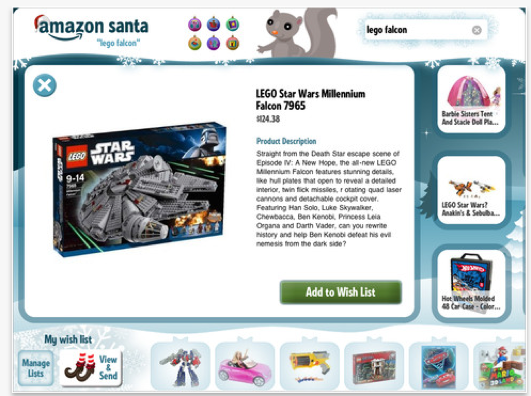 Amazon is debuting another holiday shopping app, but this offering is geared towards kids. Amazon Santa is a free app for Kindle Fire and the iPad that allows children and their parents to create holiday Wish Lists to share with friends, family and of course, Santa Claus. 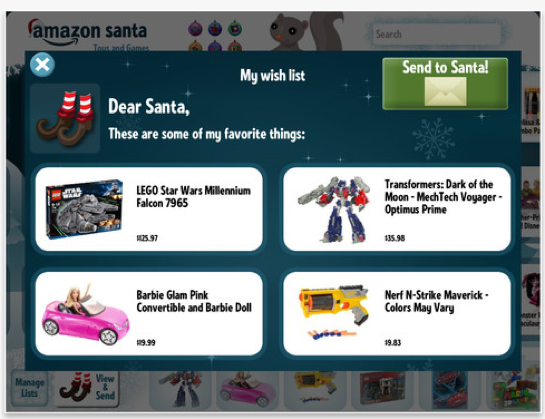 Basically, Amazon Santa brings the e-commerce giant’s wish list functionality in a kid-friendly app. Kids can browse and search more than 500,000 toys, games, books, clothes and other kids items. Kids can then make holiday wish lists that can be shared with loved ones. Of course, kids under a certain age will need to a little help from parents in creating wish lists. Amazon has also made the wish lists secure—lists created by kids through the app will only be able to be seen by authorized viewers who receive the Wish List link. Parents can review and edit the Wish List as needed and the list shows recipients wished-for items, including those that have already been purchased, similar to a gift registry. It’s actually a useful app to have when it comes to shopping for children. It can be tough to know what “Santa” should bring kids for Christmas and this provides a fun way for children to create their lists, and an easy way for grandparents, aunts, uncles and more to find the right gift.